What Is The Value Of My Hay? We’ve been blessed with more rain overall compared to other parts of the state. We had a slow spring with a very dry April and May and some weird fertility issues to start the season. Below is bermuda field picture taken in May. You can see the yellow tint in parts of the field that we thought was related to fertility. 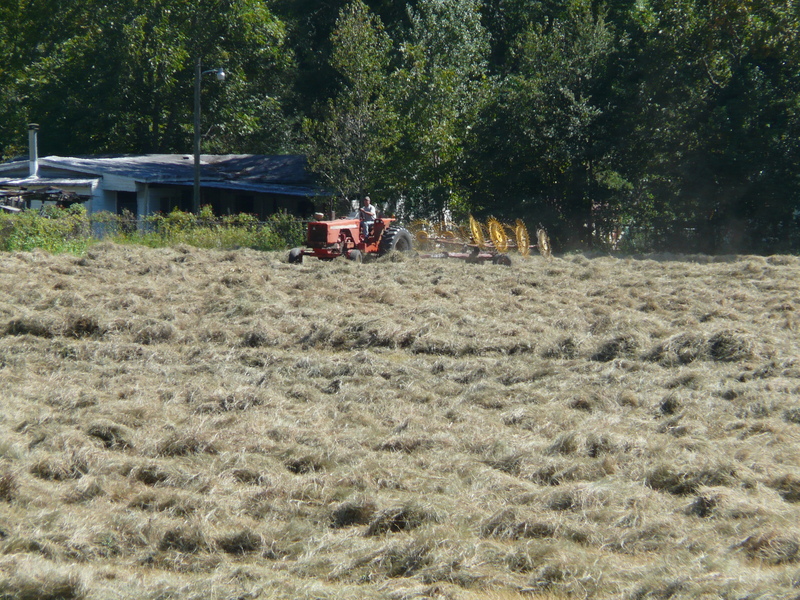 Many producers have cut hay three and four times. Our rain has been decent in amount, but it has all come at once. We started very dry, then would get 7″ and 9″ at a time. The summer was fair with more timely rain. We got dry before the tropical storm, and then had lots of rain from Hermine. One of the most common questions I get asked as an extension agent is “What is the value of my hay?” This common question does not have a simple answer. What I tell producers…. is it depends. The first step in developing a value for your hay is determining your cost of production. This is important whether you plan to sell your hay or feed it yourself. The best way to establish your cost of production is by calculating your hay cost per ton or per bale. As you begin this process you will need to your fixed and variable costs. Fixed costs will include line items such as interest, rental, depreciation, taxes, insurance, etc. One thing I always advise my clients is to be sure and include machinery costs in their calculations, because as we all know eventually our equipment will need to be replaced. Fixed cost may vary significantly between producers depending on the number of bales produced per year and each person’s investment in equipment. Variable cost will fluctuate with the level of production. Variable costs include items such as fertilizers, chemicals, labor, fuel, etc. The following formula would be used to calculate cost per bale or ton. As you move forward with cost determination, those who are planning on selling their hay need to be aware of what the market is willing to pay. Many niche or specialty markets, such as “horse quality” square bales can command a significant premium per ton over round bales. Take the time to investigate your area and include your findings when determining your selling price. If you are producing hay for your own use or plan to market your hay based on Forage Quality, you need to know the nutrient composition of your hay. The concentration of nutrients (Crude Protein, TDN, Fiber Content or digestibility) cannot be determined by the feel, texture, smell or color. Just using these parameters can often times lead producers astray. The photo below is a good example. Even though the bales in Lot 1 are sun bleached they actually test higher in overall nutrient content. The only way to determine the true quality of a forage is to Forage Test. The average cost of a forage test is less than one round bale of hay. UGA’s recommendation is to sample each cutting of forage from each field. The information you gain from forage testing will allow you or your customer to make more informed feeding/supplement decisions. Table 1 shows how forage quality effects the supplement needs, i.e. cost of a lactating beef cow. Table 1. 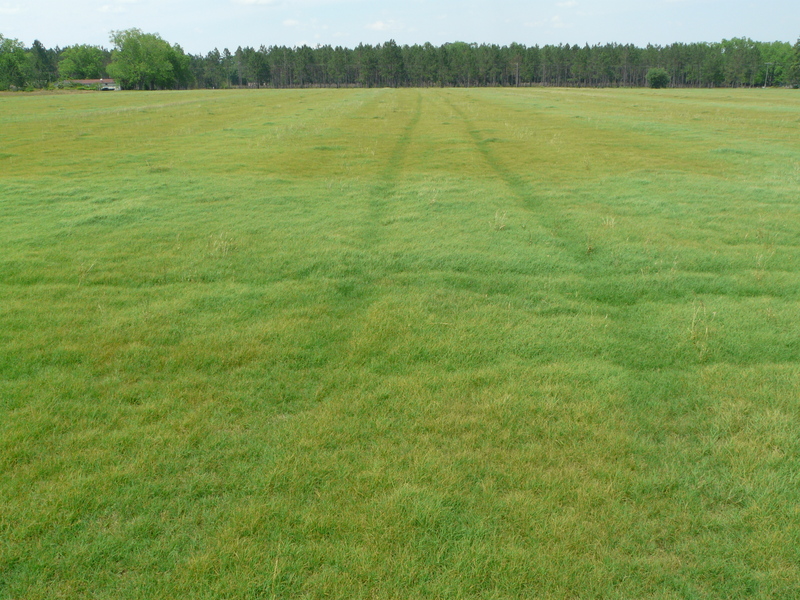 The effect of bermudagrass and tall fescue maturity on hay quality, supplementation rate, and cost of supplementing a lactating beef cow. So why not just use table 1 to estimate quality for my hay? Even a small change in nutrient value can have an impact on hays’ dollar value. Using the nutrient ranges in the chart above, Good Bermudagrass Hay cut at 4 week intervals will range in “average” nutrient value from 10-12% for crude protein and 58-62 % in TDN (energy levels). So is there any difference in “worth” between 4 week Bermudagrass hay that is 12% protein AND 60 TDN AND 4 week Bermudagrass hay that is 10% protein and 58% TDN? Yes! I entered hay with both values into the UGA Basic Balancer for beef cattle to compare. The 10% protein and 58% TDN valued hay required almost 3 pounds of soyhulls/distillers grain supplement to meet protein and energy (TDN) needs. The lower nutrient value hay cost $0.13 more per cow per day to feed. This means that the higher protein and TDN is “worth” nine dollars more per ton. I also compared 4-week old hay to 8-week hay using the UGA Basic Balancer. This comparison revealed a $35 per ton difference in value at current commodity prices. Like I said, the value of your hay depends on many different variables; however, it is key to know your production costs and the true nutrient content of your hay. This information combined will be the best predicator of what your hay is worth to you. 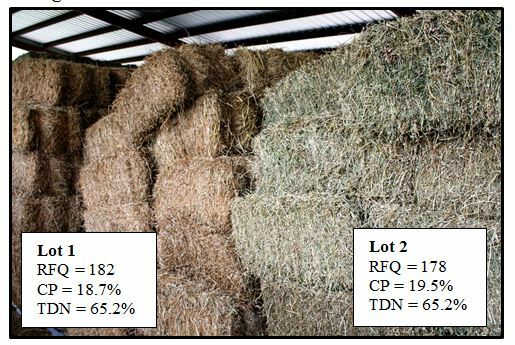 This article contains information from Dr. Curt Lacy’s Economics of Hay Production and UGA Extension Bulletin 1425, Understanding and Improving Forage Quality.